What is the connection between the 1968 summer Olympic Games in Mexico City and the Gironde towns of Braud-et-Saint-Louis, Cestas, Lesparre-Médoc and Saint-Médard-en-Jalles? The answer involves swimming… for we give you the remarkable “piscine Tournesol”! 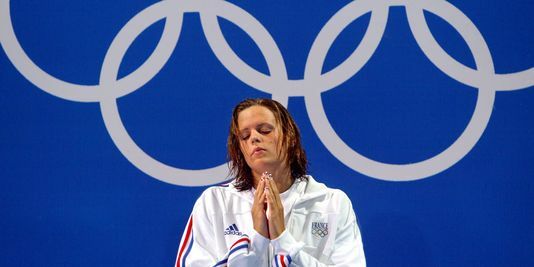 The story goes that, at the 1968 Olympics, the performance of France’s swimmers was particularly disappointing. This resulted in a nationwide action plan that was launched the following year by the State secretary for Youth, Sport and Leisure to bring swimming to the masses. The plan, codenamed “1000 piscines”, provided a structure and support for the construction of affordable pools, which would in turn make swimming more easily accessible. Although the number of pools built as part of the plan ultimately fell short of the symbolic figure of 1,000, between 600 and 700 establishments reportedly came to be built. Various designs were rolled out, with poetic names such as “Plein-Ciel”, “Plein-Soleil” and “Caneton”, but the most distinctive and memorable was surely the sunflower-inspired “Tournesol”. 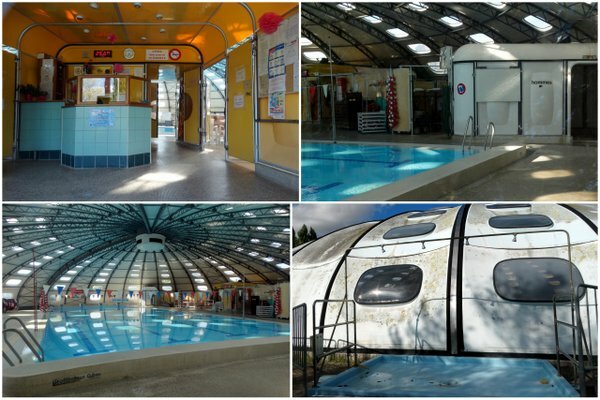 This became the archetype for the deployment of the “1000 piscines” strategy and, over the course of the 1970s and early 1980s, 183 piscines Tournesol were built throughout France. The Tournesol pools in Braud-et-Saint-Louis (top) and Cestas. 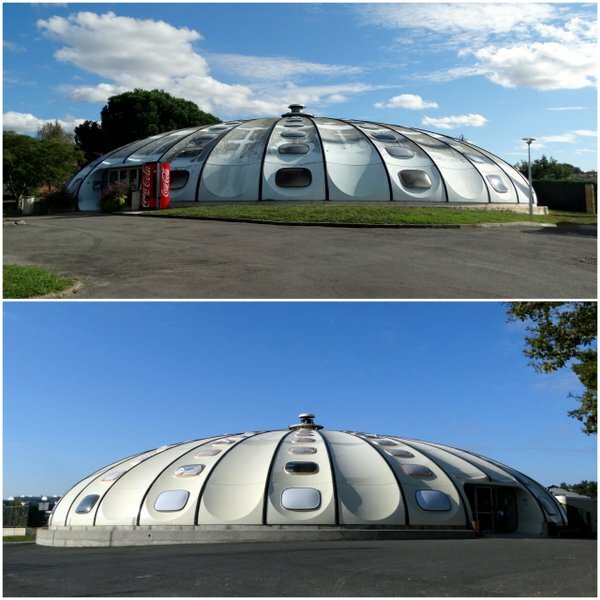 The curious futuristic design was the work of the architect Bernard Schoeller, who collaborated with the engineer Thémis Constantinidis on the conception of the structure, and with the company Matra for the choice of materials to be employed for what was to be, in essence, mass-produced pre-fabricated units, right down to the filtering and heating systems, the changing rooms and even the lavatories. 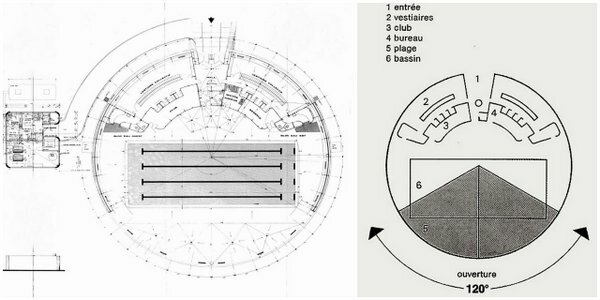 Design and overall concept of the Tournesol pools, as featured on http://www.archi-wiki.org (contributor: Lionel Grandadam). The circular structure conceived by Schoeller with Constantinidis measured 35 metres from side to side, totalling a surface area of 1,000 square metres at the heart of which was positioned a 25-metre pool. The structure was to be formed by 36 metallic arches, which combined to create a dome which would be six metres high at its apex. The elements that formed the shell were to be made out of polyester, every other segment comprising seven porthole-like windows. Significantly, two of the sections would be mobile, running on a rail system and making it possible to open the roof 60° either way. This resulted in the piscine Tournesol’s most notable feature: the ability to be instantly transformed, whenever the weather permitted it, from an indoor pool into an outdoor pool (at least over a 120° span) bearing in mind that, in most cases, a grassy area would complete the picture, enabling swimmers to head outside and sunbathe between dips in the water. 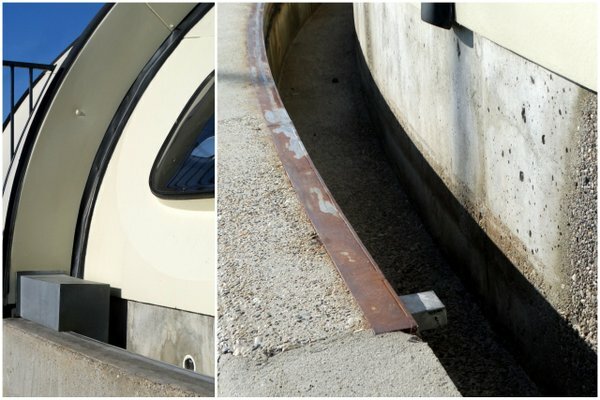 The rail system which enabled the switch from indoor to outdoor pool status. Pictures taken in Cestas. After a prototype was successfully built in 1972 in Nangis, to the east of Paris, a first “series-produced” model was opened in Roissy-en-Brie later that year. Both have since been demolished. All of which brings us to la Gironde and its grand total of four piscines Tournesol. Three went up in 1975 in Cestas, Lesparre-Médoc and Braud-et-Saint-Louis. The Saint-Médard-en-Jalles pool followed in 1981. The Gironde pools came in various colours. The Cestas shell was produced in a shade of yellow, while the Braud-et-Saint-Louis and Saint-Médard domes were pale blue. The Lesparre offering was the eminently collectible burgundy (Médoc?) red. But what has become of them? The Cestas pool is doing very well thank you. It is located on a large sports complex just off the A63 motorway, making for the pleasing sight of swimmers mingling with footballers, rugby players and tennis players. If you want to enjoy a swim there, admission will set you back just €1.60 euros. The Braud-et-Saint-Louis pool is also operational, although there is much talk about its fate and it may soon make way for a more ambitious “centre aquatique” offering smaller pools for toddlers, water-slides and the like. 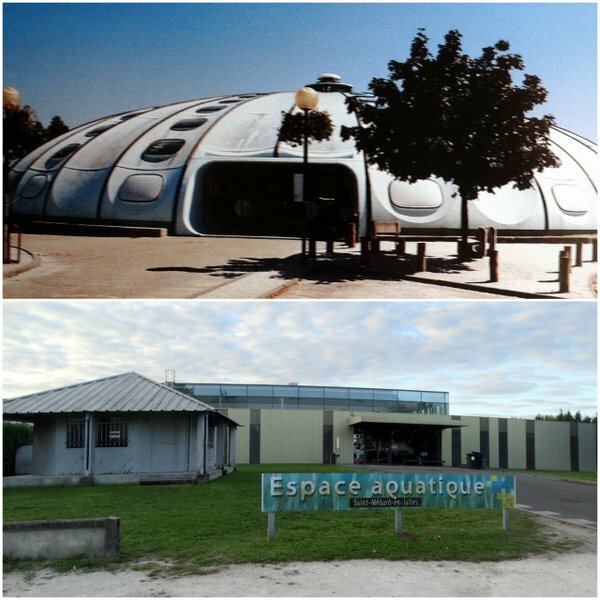 Scenes from Braud-et-Saint-Louis, including the reception area (top left), the prefabricated changing rooms (top right) and, bottom right, the outdoor foot bath located by the joint between the two moving panels. If so, it would be replicating exactly what happened in Saint-Médard-en-Jalles where the piscine Tournesol was a shorter-lived venture. In a state of disrepair after 26 years of use, it was dismantled in 2007 to make way for today’s modern swimming complex, which retained the 25-metre pool from its previous incarnation. Saint-Médard: the way it was (source: Saint-Médard-en-Jalles, au fil du temps) and the way it is today. Let’s finish off in Lesparre, where the dust has more or less settled after the recent demolition of the structure, which had come to be regarded as an eyesore for visitors and locals as they drove into this quaint Médocain town. The pool had been closed since June 2014, although the original plan was to refurbish the facility. Then came the news over the summer of 2016 that the pool was to be erased completely, and the €70,000 demolition job was completed in September. As I saw when I visited the site, nothing remains of the pool (other than a small technical unit) and the area has been totally covered in sand. Once again, plans are gradually taking shape for a more substantial swimming complex to serve the surrounding area. Lesparre: top right, the pool as it was (source: www.pss-archi.eu); main photo, demolition work in progress (source: www.sudouest.fr); bottom right, the scene today. If you’ve been reading carefully, you have therefore no doubt worked out that, of Gironde’s four piscines Tournesol, only two remain, and the future looks particularly uncertain for one of the two! A part of me does think this is a shame, however old-school and rudimentary Tournesol pools may seem in an age of big-thrill water parks. And it doesn’t necessarily have to be that way: while Gironde’s sunflower pools have fallen into disrepair and become regarded as eyesores, elsewhere they have been meticulously maintained and have even been officially listed as 20th-Century Heritage: the “Patrimoine du XXe Siècle” label has been bestowed on piscines Tournesol in Marseille, Carros-le-Neuf (near Nice) and even in Biscarrosse in Gironde’s neighbouring Landes department. What is more, they are cherished by many in France, with online traces of this affection including regular appearances on the Architectures de Cartes Postales website, and the delightful @laffairetournesol Instagram account. an Invisible Bordeaux item (source: lemonde.fr). New video: the extreme Gironde roadtrip!